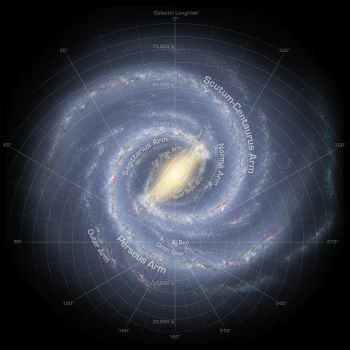 Although most parts of the Milky Way galaxy are relatively uncrowded -- for example, the nearest star to our Sun is 4.2 light-years (ly) away -- roughly 10 million stars are known to orbit within just a single light-year of the galactic center in a region known as the central bulge. In 1999, two teams of astronomers using the Hubble Space Telescope to observe 200 spiral galaxies within 100 million light-years of Earth announced that the evolutionary paths of galactic bulges and disks are connected. A spiral galaxy's central bulge appears to stabilize its development and influcence the ebb and flow of star birth in the core. One team confirmed that the central bulges of 20 tightly wound spirals were all created at more or less the same time in the early universe. 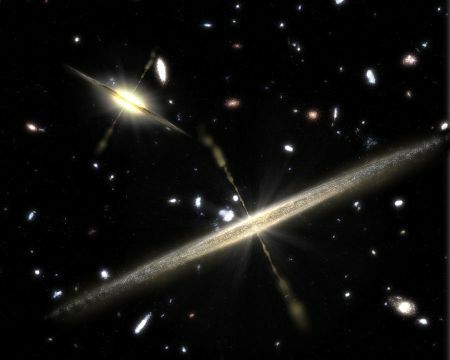 The other found that surveyed galaxies that have small bulges and bar-like structures that bisect the nucleus seemed to have grown more recently, through markedly different processes happening within the galaxy's disk (more discussion with images and illustrations from hubblesite.org). Robert Gendler, Amanda Smith, IoA, Cambridge U. In a pre-print submitted in January 19, 2011, a team of astronomers reported that the supermassive central black holes of galaxies appear to be dependent on the size of their central bulge of stars, rather than on the size of their spiral disk or "pseudobulges." Supermassive black holes have been found at the centers of nearly all galaxies observed, and larger black holes have been found in larger galaxies (those surrounded by the largest dark matter halos). The astronomers found, however, that galaxies without a bulge -- even if they are embedded in massive dark matter halos -- contain very low mass black holes, if any. Hence, they concluded that the growth of supermassive black holes in galaxies is primarily dependent on the formation of a central bulge, rather than to the surrounding mass of dark matter (MPE news release; and Kormendy et al, 2011). On June 3, 2008, astronomers using the infrared Spitzer Space Telescope announced that only two "major" spiral arms (Scutum-Centaurus and Perseus) of the Milky Way extend from the large bar of stars dominating the central bulge of the galaxy, instead of four as previously believed. In findings presented at the 212th American Astronomical Society meeting, the Milky Way's two other spiral arms (Norma and Sagittarius) were demoted to "minor" status as less distinct arms between the two major arms that have lower densities of both young and old stars but abundant gas with pockets of star-forming activity. The new view of the galaxy also includes two minor spiral arms enclosing the central bar of the galaxy, called the "Near" and "Far 3-kiloparsec" arms, which are shorter than the two major arms and were discovered through radio-telescopic observations of galactic gas (Spitzer news release and Astronomy Picture of the Day). 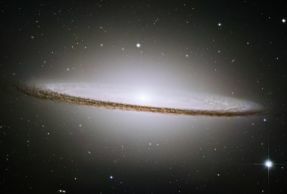 On January 5, 2009, astronomers using the Very Long Baseline Array (VLBA) radio telescope announced that the rotation speed of the galaxy at the location of the Solar System around 28,000 light-years from the galactic center is roughly 100,000 miles per hour faster than previously estimated, at 568,000 miles (or 914,000 kilometers) per hour (CfA press release). 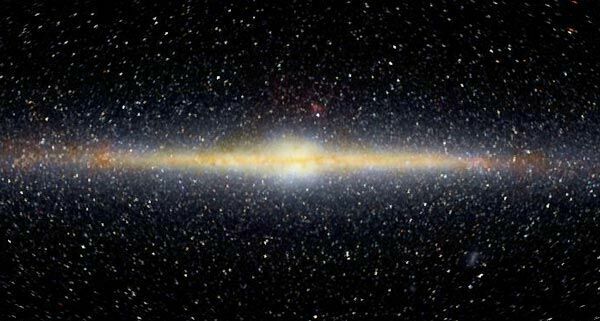 In findings presented at the 213th American Astronomical Society meeting, the astronomers also noted that the increased rotation speed implies that the Milky Way is some 50 percent more massive than previously estimated, making it about as large as the nearby Andromeda Galaxy. 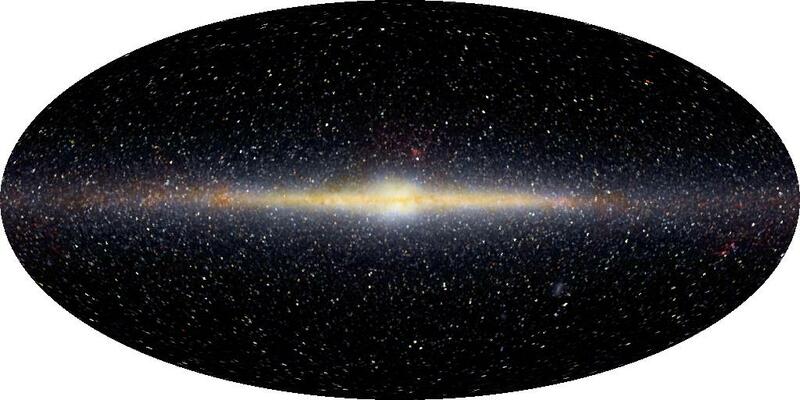 The Milky Way's larger mass estimate means that its gravitational pull is greater, which increases the likelihood of collisions with neighboring galaxies. 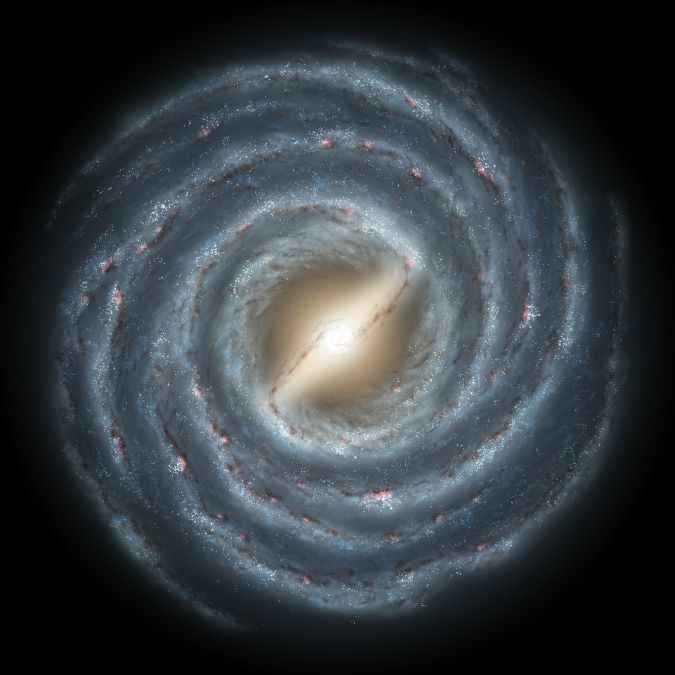 Spiral galaxies like the Milky Way are observed as two basic types. A normal spiral, such as the nearby Andromeda galaxy, has a spherical bulge of stars at its center. The other type is the barred spiral, which has an elongated central bulge called a bar. During the 1960s, the late astronomer G�rard [Henri] de Vaucouleurs (1918-1995) suggested that the Milky Way galaxy's central bulge is elongated in a "bar" structure. This was later confirmed by DIRBE infrared maps (Dwek et al, 1995) and by the observed distribution of clump giant stars (Stanek et al, 1995). Subsequent infrared surveys with NASA's Spitzer Space Telescope directly ascertained the size and shape of the bar by using the distribution of some 30 million stars within the central bulge, stretching 27,000 light-years from end to end. The bar extends from the galactic core as two 14,000-light-year-long, massive arms of stars angled about 45 degrees from a line connecting the Sun and the galactic center. 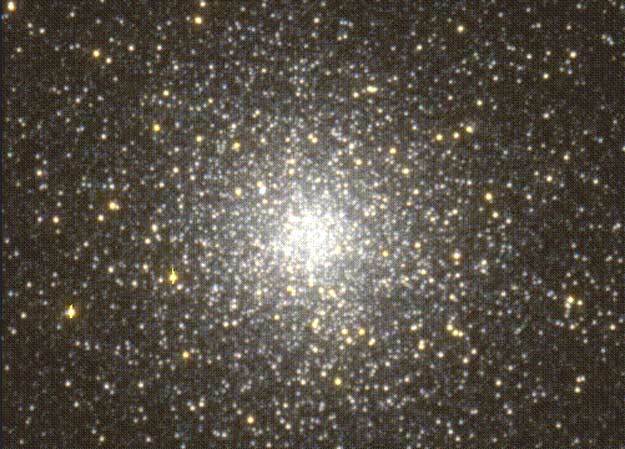 This census used mid-infrared wavelengths to penetrate through the gas and dust towards the galactic center and detect old orange-red and red (late K and M) giant stars which radiate abundant infrared radiation, which is one reason the bar can be identified (University of Wisconsin-Madison press release; Francis Reddy, Astronomy, August 17, 2005; Benjamin et al, 2005; and proposed further research by Frinchaboy et al, 2007)). The central bar is thought to spin like a propeller inside the galactic center, helping to create its spiral shape. Observations of other galaxies also suggest that these central bars may help to feed the supermassive central black holes believed to lay at the core of many large galaxies, including the Milky Way. Some astronomers believe that the Central Bulge was the first massive component of the Milky Way galaxy to have developed, earlier and faster than the thick disk. Although the central bulge formed relatively quickly on a timescale of around a billion years, the bulk of the metal-rich stellar population of the Galactic bulge appears to be very old, with an age of around 10 � 2.5 billion years (Zoccali et al, 2003; and Ortolani et al, 1995). 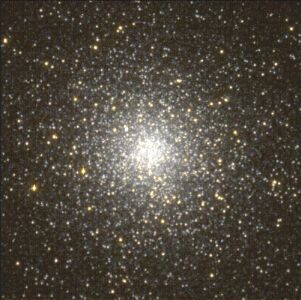 There are traces of a small fractions of intermediate-age stars born in subsequent eras, and of metal-poor stars, which may well be the oldest stellar population in the galaxy. 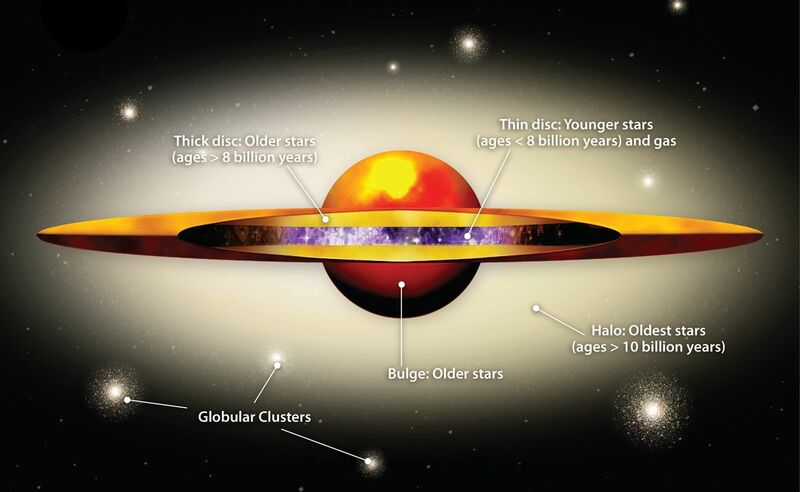 Unlike the arms of spirals which are active star-forming regions, the bulge probably formed in a series of starbursts about 12 billion years ago � that is, more than a billion years after the Big Bang (Zoccali et al, 2006; and Iye et al, 2006). Old giant stars dominate in the bulge, centered around the supermassive central black hole (Minniti and Zoccali, 2007; and Venllenari et al, 1999.) However, enough gas and dust are still being drawn in from outlying regions by gravitational attraction towards the massive galactic core that extremely high-mass but short-lived stars (such as the Pistol Star) are still being born in the bulge, even near the central black hole. not have a central "bulge"
On January 10, 2008, astronomers using the infrared Spitzer Space Telescope announced that they had found some "thin" spiral galaxies (lacking a central "bulge" or concentration of stars) which also host supermassive central black holes. These holes were detected because they were "feeding" on accreting matter and "spitting out" high energy light via bi-polar jets that ionize gas in and around galactic cores, including neon-5 which black holes (but not stars) have sufficient energy to excite such a highly ionized state. Previous observations had suggested that the more massive the central bulge in spiral galaxies, the more massive their central black holes. Their findings indicate that the development of a central bulge is not necessarily associated with the development of a supermassive black hole. Alternatively, some astronomers suggest that large concentrations of dark matter may have played vital roles early in the development of supermassive black holes (more from SSC and Seth et al, 2007). A review of current knowledge is available from Minniti and Zoccali, 2007. © 2007-2011 Sol Company. All Rights Reserved.